This all pink facade belongs to the Paul Smith store in West Hollywood, and it’s the only of its kind. Each of the brand’s locations boasts a different graphic design. Contemporary artist RETNA creates graffiti murals with unique script across the globe. His work appears locally at the West Hollywood Library on San Vicente Boulevard and Craig’s restaurant on Melrose Avenue, among other locations. This locally-inspired art been a popular backdrop for photographs since it appeared in 2013. New York-based artist Curtis Kulig’s “Love Me” campaign has spread its love across structures from Paris to Berlin, and on clothing from brands including Urban Outfitters and Vans. Maybe not exactly a wall, this colorful staircase is nonetheless a favorite backdrop for Instagrammers willing to walk up a few steps. Officially referred to as the Micheltorena Stairs, they were given their fun paint job by local artist Corinne Carrey. Colette Miller’s angel wings are painted everywhere from Kenya to Melbourne, but here in Los Angeles, where they first appeared, there are four installations: on West 3rd Street at Orlando Avenue, at Westfield Century City, on the doors of the Regent Theater downtown, and in West Hollywood on Palm Avenue at Santa Monica Boulevard. A giant “Hello” surrounded by roses, berries, and fruit (formerly pink and red kisses) is just one of two photo-ready walls at the extremely Instagram-friendly Carrera Cafe; they also offer a space for rotating murals inspired by current movies, including one for La La Land which proved particularly popular. There are several #LoveWall murals around (including some not-entirely-authorized versions of street artist James Goldcrown’s original design), all sporting variations on the colorful, drippy heart motif. This one is behind Bardonna, where the palm frond wallpaper inside also makes a great backdrop for snaps. The Most Famous Artist, AKA Matty Mo, has made many marks on L.A.’s walls (remember those hot pink houses?) 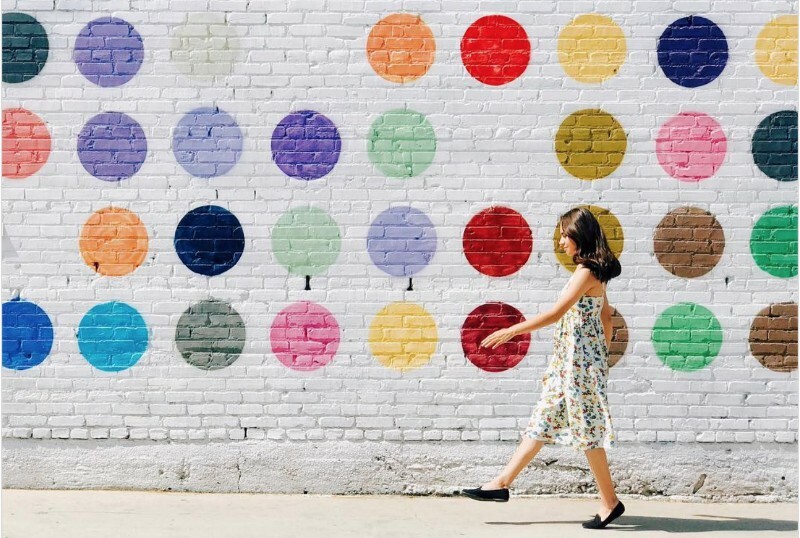 but this dotty spot in the DTLA Arts District remains one of his most popular — and most Instagrammed. Bonus points if you find the corner where he also painted a human-sized honey bear.